From food-inspired beer by a former Goose Island brewer to an in-house birreria at Eataly, more than 14 new breweries are opening in Chicago this fall and winter. Courtesy Penrose Tom Korder, formerly at Goose Island, works on a collaboration with St. Louis' Perennial Ales. With so many new breweries popping up all over the Chicagoland area in every size and shape, it’s damn near impossible to keep track of them all. In Chicago, brewers are moving into neighborhoods like Little Village and the South Loop, while the suburbs aren’t slacking in growth—Geneva, Tinley Park, Lyons and Northbrook all have brewery projects rolling out or in the process of starting up. Lots of them are tweeting their progress, so we've included links to their Twitter feeds to follow along. Here’s a look at some of the breweries we’re excited to see pouring soon. The impetus for 350 Brewing Company started where so much beer appreciation begins: college. Working from a 3.5bbl Psycho Brew system—the same make and size that Chicago stalwarts Pipeworks started from—the self-taught Pizer and co-founder Todd Randall aim to brew a bunch of different styles and let the customers tell them what they like. “Our small size makes us flexible enough to not have to have a flagship at the beginning,” he says. The undergrad-esque outlook is expected to carry through to the taproom experience—“The idea is ‘a day after a party at the 350 House,’” per Pizer. Owner and co-founder Chris Tourre wants to let art drive Arcade's beers—they’ve established connections with comic artists who will be creating six-panel comics to tell a story in a six-pack. Rather than contract or build out their own space, they’ve entered into a unique arrangement with Ale Syndicate. Where: The license is prepped and a 5 barrel (bbl) system awaits—they just need to find the right space. Out of all the breweries not yet opened in Chicago, Aleman might have the largest national level of awareness—their Dayman coffee IPA, brewed as a collaboration with Aleman and Two Brothers and made by California superbrewers Stone, was released in March and currently earns a ranking of “Outstanding” by the BeerAdvocate users. A collaboration of another style is already in the works, though—Alzheimer’s charity MaeBell Ward Foundation has authorized funds for Aleman to purchase a fermenter. Profits from those beers will be directed back to the charity. Initial Offerings: Like the New York version, expect two year-round brews and a seasonal on cask. From the size of the space (60,000 square feet) to the location (smack dab in River North) to the people behind it (Mario Batali, Joe Bastianich), Eataly does things, shall we say, molto. So rather than just buy a bunch of beer to serve alongside the available offerings, why not brew their own right there? That’s the plan that’s worked thus far for the New York Eataly, and Chicago brings brewer Tyler Prokop to town to helm Chicago’s Birreria. He’ll lead the program set in place by Sam Calagione of Dogfish Head along with Italian brewing luminaries Teo Musso and Leonardo DiVicenzo. Those in-house beers will be available alongside other Italian and American craft beers, paired with a beer-friendly menu of cheeses, cured meats and rotisserie items. After cutting his teeth working for homebrew outfitters like Northern Brewer and as a consultant for a number of Wisconsin breweries, head brewer and owner David Kelley came home to open his own shop with friend Jordan Isenberg. They’ll be self-distributing around Chicago, as well as some specifically selected bars north of the city. The pair want a bar in each of their towns, so they can "walk down the street and have a Blue Nose,” Kelley says. “We aim for really, really good beer that whether you are a huge beer connoisseur or someone drinking for the first time, you can enjoy,” says Kelley. His favorite beer, however, may be one that puts off those diametrically opposed to adjuncts. Their World War American Lager is made with corn (yes, adjunct beers can be made well), and it’s Kelley’s favorite beer to make. Where: Building out a space on South Michigan Avenue for a taproom and production facility; it’ll be one of only a handful of LEED certified breweries in the country. 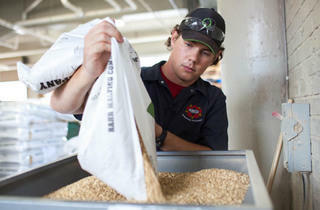 After starting at Goose Island’s brewpub and Fulton Avenue production facility and then moving to Milwaukee’s Lakefront Brewing as their quality control manager, head brewer Frank Lassandrello saw the quality assurance issues that can occur when you fight for shelf space, which is why freshness is paramount to him. “A lot of beer sits for a very long time,” he says, which is why he was planning on Broad Shoulders being a production facility for distribution of Lake Shore Drive Lager and Blue Eyed Blonde kegs only—until the neighborhood told him they wanted a taproom as well. After adjusting his plans accordingly, he’ll have a space for growler fills and special-release 22-ounce bombers. The taproom features tables made from reclaimed ceiling joists pulled from his historic Motor Row building. Starting with collaboration beers and two main flagships, Lassandrello’s brews might be the first local craft beer many non-Chicagoans ever taste—his space is located just steps from McCormick Place West and its many thirsty conventioneers. Another Haymarket/Buckledown collaboration is in the works, and another collaboration with DryHop Brewers is expected before buckling down (we had to) at their own space and beginning to brew on their own gear, which will arrive from China in mid-October. In addition to Belt & Suspenders and Fiddlesticks, Buckledown will roll out a Belgian single called Mirth and a robust porter called Shady Aftermath. Those beers, plus special one-off brews, collaborations and a handful of local guest handles will be available by the pour at their taproom, but Wirtz will earmark most of the beer for distribution. They’re set to start brewing officially at their location in Lyons shortly—just an inspection from the state and the delivery of their 15bbl brewhouse is in the way. Initial offerings: Food-inspired brews flavored with ingredients like gingerbread and nectarines on draft. A taproom and packaging will come shortly after. Perhaps the most accomplished culinary brewer out there, Jared Rouben started in restaurants as a Culinary Institute of America grad, with stints at the Michelin-starred Martini House and Thomas Keller’s famed Per Se in New York. Not content with just making food, Rouben came to Chicago to brew. He spent time at Rock Bottom and quickly moved to Goose Island where he crafted his “culinary brewing” style with chefs like Rick Bayless, Rick Gresh and Kevin Hickey. Working on a 20bbl system designed for Rouben’s “culinary brewing,” the brewery will have a taproom. Rouben expects to produce upwards of 2,000 barrels in his first year. Initial offerings: Small batches, available by the bottle at Lush and on draft at Twisted Spoke. A brewing collaboration with New Belgium for Twisted Spoke’s 15th anniversary started the ball rolling on the Nomad brand, after it allowed Einhorn to get in on the brewing process. Years later, they’ve released their first offering under their own label, an imperial brown ale barrel-aged for two years in Stitzel-Weller barrels. Not confined to a production space—even if their beers take off, that’s still a long way down the road—the Nomad name “expresses the true nature of what we’re doing... we’re willing to travel wherever it go to find collaborative partners.” Future brews will likely feature Belgian styles, gueze and lambics that pair well with food. But why create their own in-house brand, when they already have a successful restaurant and retail space? For the joy of hospitality education, naturally. It’s possible Only Child’s Ben Rossi wouldn’t have kicked his brewing dreams into high gear if the avid homebrewer could have fermented his beer anywhere other than his and his wife’s bedroom. “The most stable temperature in my house was in our bedroom, and so we’d fall asleep listening to the airlock bubbling,” he says. As the beer purchaser for Lincoln Square’s Grafton Pub, Rossi knew he had enough experience in the industry and with brewing to give it a go professionally—and getting his brew gear out of the bedroom was a motivating factor as well. Rossi grew up in Grayslake and wanted to bring his love of craft beer north of the city. Bottles can be found at Binny’s around the north ‘burbs and at Capone’s in Chicago; his space is too small for a taproom, but Rossi hopes to have space for a bottle shop to feature his beers alongside bottles from other Chicago-area brewers. The brewers at Geneva’s Penrose aren’t afraid to think big—they’re starting their brewery with a big ol’ 40bbl brewhouse along with a 1bbl pilot system for experimentation. Tom Korder, formerly at Goose Island, and beer industry veteran Eric Hobbs are ready to roll out up to a half-dozen styles on draft. They’re planning to begin packaging a few months later. A slightly tart, strong golden ale called Hereafter, a collaboration with St. Louis’ Perennial Ales, is in the hopper, and a collaboration with Off Color was poured at West Lakeview Liquors’ Zwanze Day. In addition to their Belgian-inspired ales, they’ll also focus feature barrel aging and—heads up, sour fans—wild and spontaneous fermentation. 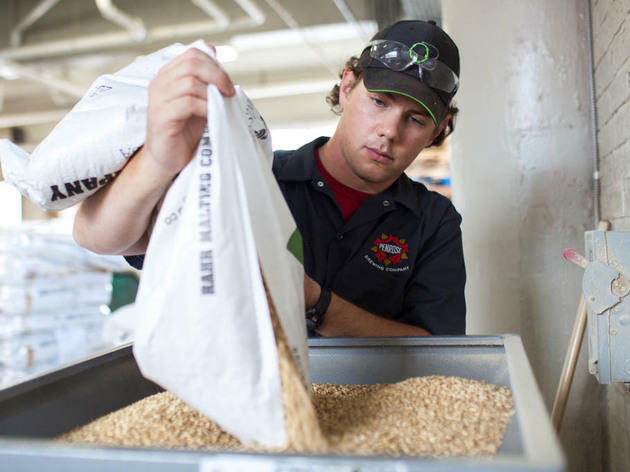 It’s not just the brewers’ experience that’s ensuring quality from day one. Penrose will have a quality assurance lab on site from the get-go and they’re testing every batch to make sure the 2,000 barrels they aim to produce in their first year taste exactly as they’re supposed to. Like many other brewers, SlapShot came about due to “homebrewing run amok,” as Steve Miller put it. After brewing at home for 6–7 years, Miller started contract brewing on the system owned by Westmont’s Urban Legend. SlapShot (the name is inspired by Miller’s lifelong love of hockey), expects to be brewing on their own 3.5bbl system in about two months, as soon as licensing is complete with the Alcohol and Tobacco Tax and Trade Bureau and the state. Bringing a taproom to the Little Village community was part of the plan. Alderman Munoz, who told Miller he hadn’t approved a new liquor license for the neighborhood in more than two decades, could have stopped it in its tracks. Luckily some homebrewers on the Alderman’s staff stepped in and helped clarify the differences between a brewery taproom and a straight-up bar. It did the trick—some zoning issues stand in the way, but the Alderman’s office is on board. SlapShot’s main focus will be sessionable beers. A brewery seemingly a century in the making (if you consider Evanston’s Women’s Christian Temperance Movement a starting point for a brewery in the same town), the impetus to make beer in Evanston was “kinda selfish,” as Josh Gilbert describes it. As someone who grew up there, his motivation was to bring a brewery back to his town, and he wasn’t worried about what the ghosts of those teetotalers might say. “This city is a lot different now than when the WCTU was around,” he says. Gilbert lent a hand on Hamburger Mary’s craft beers, plus he’s been homebrewing, tending bar and working as an architect. Temperance’s head of brewing operations, Claudia Jenron, comes from Goose Island. The 20bbl system produces beers like the National Anthem, made with red and white wheat along with blueberries (get it?). Other beers to look forward to include the licorice and chicory Root Down porter, a classic Extra Special Bitter and a rye pale ale. Find it on kegs to start, with a taproom to open later this year. Brewer Jerry Nelson started making his own beer while stationed as a Marine in 1995, but let the hobby go dormant while working as an architect. After a request for some homemade beer at a backyard party, the impetus to brew his Belgian inspired offerings came back. With a focus on seasonally varied offerings (Une Année translates to “one year” in French), Nelson’s Belgian-inspired beers include the Maya Belgian IPA and the Less is More session saison. A collaboration with DryHop Brewers called Devil’s Reign is also available and the brand new 8.7 percent Trappist-style with American hops called Masquerade will be released soon. The West Loop space is in a part of the neighborhood currently under a liquor moratorium, so don’t expect a taproom any time soon, but Nelson expects bottles to follow shortly, possibly by the end of October. Here’s a handful of the other breweries that we’ve found who at least have a digital presence, if not some solid movement towards existence. Is this an exhaustive list of what’s coming to the city? Of course not. And besides, if the many homebrewers in the Chicago area take their cues from every brewer in this roundup who described their efforts as an overgrown hobby writ large, we’re nowhere near through. And as for the words “bubble” and “burst” and “when will the” being thrown around? Good news—the Brewer’s Association says we’re not even close.